^ Kawachi M, Inouye I, Honda D, O'Kelly CJ, Bailey JC,Bidigare RR, Andersen RA (2002). “The Pinguiophyceae classis nova, a new class of photosynthetic stramenopiles whose members produce large amounts of omega-3 fatty acids”. Phycol Res 50 (1): 31. ^ Bailey JC, Bidigare RR, Christensen SJ, Andersen RA (1998). “Phaeothamniophyceae classis nova. : a new lineage of chromophytes based upon photosynthetic pigments, rbcL sequence analysis and ultrastructure”. Protist 149: 245-63. ^ Guillou L, Chretiennot-Dinet MJ, Medlin LK, Claustr H, Goer SL, Vaulot D (1999). 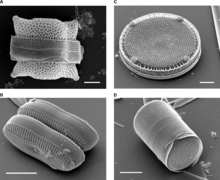 “Bolidomonas: A new genus with two species belonging to a new algal class: Bolidophyceae (Heterokonta)”. J Phycol 35: 368-81.